The Northern Oriole hits a sentimental chord with me. It was the first bird I ever rescued from the wild when I was about eight years old. 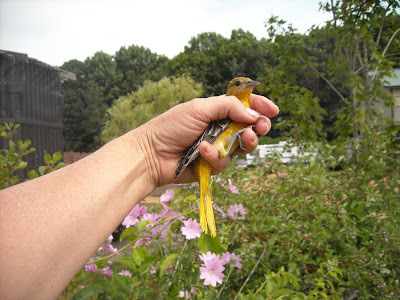 Way back then the bird was called a Baltimore Oriole. The bird I rescued was a tiny baby that had come now nest and all in a lightning storm. Some neighborhood boys had discovered the baby birds and were "not being kind" to the hatching's. I grabbed the only one still alive and raced home as fast as my legs would carry me with the boys in hot pursuit. With the help of my parents we raised the little one. he grew up to be the most beautiful bird I had ever seen. Bright orange and black he was like a moving piece of artwork. He came back every year to my parents home even after I was in college for a total of about twelve years. The patient released today did not arrive in such a harrowing way. She was admitted from Weston, WI with a wing fracture. You would not have been able to tell she had any injury as she powered into the willow tree. As she flew she gave a joyful chip that must have meant goodbye because she was gone in a flash. Female orioles are beautiful but are not as colorful as the male of their species. I am sure this female had youngsters before she was injured. She had a tell-tail brood patch on her abdomen when admitted. That is where the adults pluck their own feathers so they are in close contact to the eggs and are able to keep them warm for hatch. We hope her mate was able to raise the little ones. Perhaps the oriole family will be able to migrate to the southern climates this winter. Like many bird species northern orioles have a strong mate fidelity and often keep their same mate for a lifetime. We had several tours today. 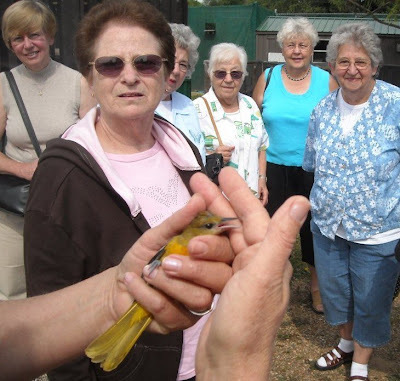 The Northern Oriole was released during the 10 AM tour with the ladies of the Calvary Lutheran Church in Merrill, WI. 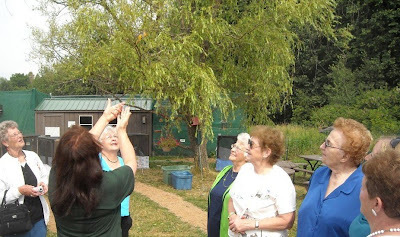 The tour group was able to take photos of the oriole just before release. That is the one time when the public can take photos of the birds in rehabilitation...as they are released to the wild. It was a beautiful day. We took advantage of the sunshine and calm weather to release several other birds that had grown up at REGI and were now ready to be on their own. Fifteen American Robins and a few Mourning Doves were released in the early morning hours. It is hard to imagine that just six weeks or so ago those same youngster were tiny babes. Some of the youngsters had fallen from nests, others were grabbed by domestic cats or dogs and still others hit windows or were hit by cars. They form a family unit here and together they face the world once released.